We offer a luxury apartment with all the comfort. The apartment has a balcony and was rebuilt in the year 2006.
for 2 people with slatted frame. 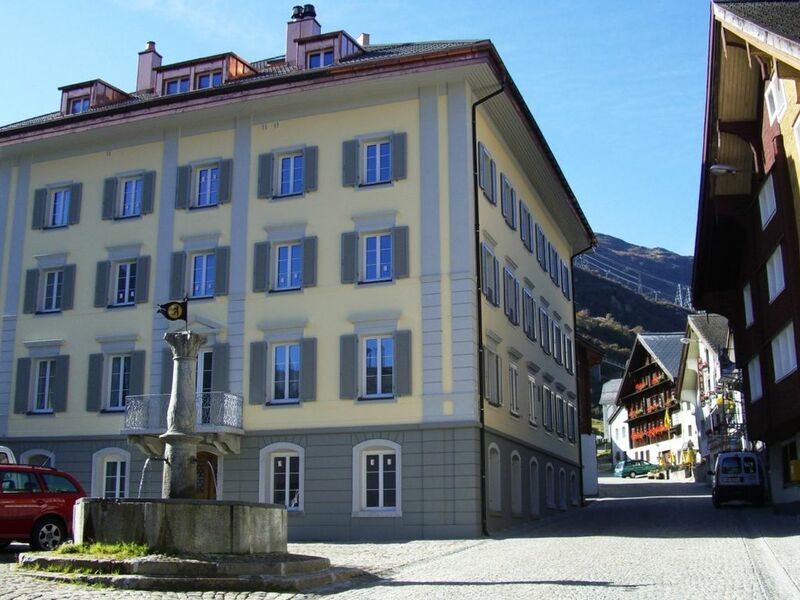 - Free parking slot in Andermatt next to the Gemsstock gondolas with our parking-card. - Electricity, bed and kitchen clothes, visitors tax and final cleaning are in the price included. - Towels can be rent for 10 Swiss Francs per person. Maria Teresa original from Chile and Ruedi Wigger from Switzerland are a 20-years married couple from Switzerland. Both live together with their Dog, Gringo, in Aarau and love to travel around the world. They created with a lot of passion this wonderful charming apartment in Hospental. You will find everything you need in it. In the middle of the centre in Switzerland. It's perfectly placed for all kind of day excursions. Free parking in underground garage in front of the house. Also free parking slot in Andermatt next to the Gemsstock Gondola. Kitchen clothes are in the price inclusive. More Towels can be rent for 10 Swiss Francs per person. Sandwich Hawaii Toaster and a normal bread toaster. New massive wood table from 2014. New Generation Smart TV with satellite and 76 different channels. Small balcony for 3 people. There is some parking space for bicycles at the basement. 2 ski-cellar in the house basement. Furthermore, there is a possibility to rent skies in Andermatt. Right next to the house is the new 18 hole gold course Andermatt. More courses in Realp and Sedrun. Sauna and Solarium for 3h just 15 Swiss Francs. Free use of the indoor pool. Wi-Fi is also for free. Towels can be rent for 10 Swiss Francs à week per person. Four of us visited for Christmas. It was so convenient to get to the slopes (bus every half hour from 2 minute walk away). The housekeeper and host were both great at communicating (especially given it was the holiday period). The place was well equipped and plenty of space for the four of us and all our Christmas/ski gear. Would definitely stay again! Add the compliment you back, very pleasant tenants, straightforward, very good communication. We are looking forward to be able to accommodate you and your family again! Sehr schöne und helle Wohnung, mit allen Utensilien, Skibus-haltestelle in der Nähe und nur 6 Minuten bis zum Skilift. Wir haben unseren Aufenthalt dort sehr genossen. P.S. lediglich einige Matratzen könnten vielleicht erneuert werden. Licht appartement en van alle gemakken voorzien. Helaas was het zwembad lek en konden wij hier geen gebruik van maken. Genoeg ruimte voor 5 personen. Dichtbij Andermatt en met parkeerpas voor de gondel. Parkeer ruimte bij het huis is klein en beperkt. Saubere und sehr gemütliche Wohnung mit allem was man braucht. Wir haben uns wie zu Hause gefühlt in der Wohnung von der Familie Wigger. Die Küche ist sehr gut ausgerüstet, und guter Kaffe gab es zur Verfügung. Die Betten sind bequem. Gratis Parkplatz beim Seilbahn ein grosses Plus. Gerne empfehlen wir dieser Wohnung weiter. Me and my family went here for our ski holidays in February 2015. We loved it! The apartment is very clean, modern and has everything you need. In particular I would like to mention the Indoor pool. It was just great to relax and calm down in the pool after a busy snowy ski day. Furthermore the apartment has a very good location. It is just 5min from Andermatt and the ski pistes away. We are looking forward to coming next year again. vielen Dank für Ihre Bewertung, die uns sehr gefreut hat, wir freuen uns Sie nächstes Jahr wieder behergen zu dürfen. El apartamento es grande, cómodo y muy bonito. Está ubicado en un paraíso natural precioso, como lo es toda Suiza. Es un lujo que disponga de piscina, que sobre todo mis hijas, han aprovechado bastante,al final del dia, después de hacer grandes excursiones. Dispone de horario libre y está climatizada. El equipamiento del apartamento es muy bueno y la única pena es que no incluya las toallas, que son de pago. Pienso que deberían incluirlas, es un detalle que lo convertiría en excelente. Pero por lo demás es totalmente recomendable. Muchas gracias a María Teresa y a Ruedi por su hospitalidad que siempre estuvieron pendientes de nuestra comodidad. DE: Kurtaxen sind im Mietpreis inbegriffen, Endreinigung ebenso, Garagenbenützung do. Sportferien 2016 mit 10% Ermässigung EN: The visitors tax, the final cleaning and the parking are in the price included.